A Collectors Guide to restoring your My Little Ponies to their original Glory. . . or Sunbeam, or Parasol. Welcome to my guide. This is a basic guide I have created for My Little Pony Lovers all over. I want to clarrify a few things first. These are just what has worked best for me, hopefully they will give you some ideas but there may be other and even better ways. I would recommend you experiment, but then you risk loosing a pony or two. There are NO customizing tips in here. Honestly, as a collector and lover of MLP's I find customizing by some to be a bit...well, cruel. There are a few customizers who will take anything and call it "bait" and customize it. In reallity there are less and less good, quality vintage MLP's left (and a few fairly rare G3 ponies too) and a lot of people who would like them. And since G! ponies seem to degrade naturally over time (even ones NIP and never opened have developed pony cancer and yellowed) that if a G1 pony can be restored it SHOULD be restored, not stripped and painted over. Not to say there are not ponies out there that make good bait but I believe what is generally considered "bait" should be re-evaluated before someone customizes. A marker stain on one foot, or trimmed hair can be fixed. Some repairs take a little bit more work but every part of the pony should be evaluated before being considered "bait". Is the head in good condition even if the body is stained?? Can the tail be slavaged? Can the stains be removed? Can the hair be replaced? If a vintage pony can be restored I believe it should be, please, if you don't want to do it then leave it for somebody else to do. And if the problem is minor (a scuffed symbol and pinpoint pony cancer spots) remember there are many pony lovers out there. 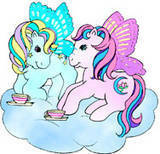 Some people cannot afford $15.00 for a mint pony and would be hppy with that little pony as long as she is still pretty. If the pony is totally unrecoverable, then customize it. Customizing can be fun and save the mold of a pony that just is beyond saving. I have seen some ponies covered with ingrained dirt, from head to toe that could not be removed. At the same time I have seen ponies covered in marker head to toe that has been removed. Hopefully this will help you so you can get those results (or close to) out of your own ponies or some ponies you got for cheap and you won't have to spend so much money. Though this does take some time and effort, if you would rather not do it then deffinetely feel free to buy one of the nice ones online as you are paying them for their efforts. Not all the products I recommend are "gentle". I will say however I have tested them all without bad results usually. If you want to CLEAN something sometimes you need to use the stinkier, harsher products to get it clean. Soap and water doesn't do much when it comes to restoration. My goal is to get your pony clean without damage. I'm sure not everyone does but I believe in the techniques I listed. If you don't like some ideas just don't do them. As well almost everything on this site that I recommend to use are things that are EASY to get. There is nothing super expensive, and nothing weird to order unless your pony is in desperate need of serious restoration. In general most of the products I list, If you don't already have, can be picked up by a quick run to your local drug or super store. This information is to be used with caution. These are just tips and should not be attempted if you do not use a little of your own common sense. Do not use harsh chemicals on gems, glitter, flocking, etc. I am not responsible if you damage one of your ponies, if they get white marks, if they fade, if you scratch or remove paint or symbols, or anything else. Restoring ponies can be tricky. I have damaged a good half dozen ponies testing different things out, hopefully you can learn from my mistakes, mixed with a little of your own common sense, and get glowing ponies. But not everything is guaranteed to work, and not everything is guaranteed to go right. Some things such as pony cancer and ingrained dirt can be very hard to remove. You attempt all cleanings at your own risk. Please don't complain to me about mistakes you made during cleaning, even if I listed the technique on my site.